As you know here at Rs3gold.com we are the best place to buy runescape 3 gold and Old School Runescape Gold, but we also love the game ourselves and that is why today we are talking about what the folks at Jagex have said they have planned for the month of September. Of course, the big news is Runefest which is taking place on the 23rd of September. This is clearly where a lot of Jagex’s focus is going to be in the coming weeks, but they are still working on making Runescape as awesome an experience as possible for us all. To start with they are changing the way they handle the polls. They are going to start with a post on the forum where us fans can have a discussion about it, then a dev blog and then the poll will go live. Not many developers would go to these lengths to get the fans input on a game so it is really cool to see. Of course, it will mean that it will take longer for a poll to take shape and to get the results from, but we think this is the right step to take. The other bit of news is that they are going to rework Mining and Smithing. There was talk of getting rid of this skill and starting it from scratch, but instead, they are going to fine tune it and from what we can see. It looks like it is going to be good for those who use this skill a great deal. With Runefest getting closer and closer that was all they had for us. But to be fair, we can only imagine what a huge undertaking Runefest is and we are just happy to see that they still have one eye on the game as well. In order to celebrate Runefest 2017,Rs3gold offer 7%-10% off cheap Rs3 gold/osrs gold from September 25 to October 10. 1.7% off Code RFT7 for your order less than $30! 2.8% off Code RFT8 for your order between $30 and $80! 3.9% off Code RFT9 for your order between $80 and $200! 4.10% off Code RFT10 for your order $200+! While,8% off code “SDM8” for Deadman Season 7 Gold on hot sale is available. The Lumbridge Tasks consist of Beginner level, Easy level, Medium level and Hard level tasks. There are no Elite tasks and serious combat tasks. When you finish one of the tasks, you will get huge rewards and experience lamp.you can get 10% off cheap runescape 3 gold on Rs3gold,never miss it. Non-set Beginner Tasks can be completed with little difficulty. It require 3 Smithing, 5 Attack, 5 Defence, 5 Ranged, 7 Magic, 7 Crafting, 10 Cooking Skills and Cook’s Assistant, The Blood Pact, The Restless Ghost, Myths of the White Lands Quests. Beginner tasks is the same as Non-set Beginner Tasks. But it only requires The Restless Ghost Quest. Completing all Beginner Tasks and speaking to Explorer Jack, you will receive an Explorer’s Ring 1 and additional rewards. When wearing, you can replenish 50% of your run energy once a day and get a 500 xp experience lamp. Easy tasks require 15 Mining, 25 Fishing, 30 Smithing, 5 Runecrafting Skills and The Restless Ghost Quest. Completing all the beginner and easy tasks and speaking to Bob the axe salesman in Lumbridge, you will get an upgraded ring, Explorer’s Ring 2 and additional rewards. When wearing, you can replenish 50% of your run energy twice per day, get 30 free Low Alchemy castings per day (requires Magic level 21), 10% chance of crafting an extra air, earth, fire or water rune for each essence you use and a 1000xp experience lamp(Level 30+). Medium tasks require 36 Smithing, 31 Magic, 30 Mining, 30 Woodcutting, 30 Firemaking, 40 Cooking, 30 Fishing, 16 Crafting Skills and Dragon Slayer, Cook’s Assistant Quest. Completing all the beginner, easy and medium tasks and speaking to Ned in Draynor Village (north of the bank), you can get an upgraded ring, Explorer’s Ring 3 and additional rewards. When wearing, you can replenish 50% of your run energy three times per day, free unlimited teleports to the cabbage patch south of Falador farm, north of Port Sarim and get 1500 xp(level 35+) experience lamp. Hard tasks require 50 Cooking, 50 Crafting, 60 Firemaking, 59 Magic, 45 Prayer, 57 Runecrafting, 68 Smithing Skills. Completing all the beginner, easy, medium, and hard tasks and speaking to Ned in Draynor Village (north of the bank), you can get the final upgraded ring, Explorer’s ring 4 and additional rewards. When wearing, you can get 27 free Superheat Item castings per day (requires Magic level 43), 15 free High-level Alchemy castings per day (requires Magic level 55) and 9000 XP (Level 49+) experience lamp. Rs3gold back to school Sale：10% off osrs gold and rs3 gold for all $50+ orders(Code:WBS10) from September 7 to september18. Never miss free 1200M RS 3 Gold & 200M RS07 on Rs3gold at 03.00am on September 13,2017 for the Double XP Weekend Promo. Use the new right-click op to challenge other players to a duel. Duelling works likes a trade in the Grand Exchange. Send a duel request to another player and accept via a message in the chat box or by selecting the duel op. If you do not wish to be bothered by requests to duel, you can filter them by either turning off the duel option or via the trade filter like with challenge offers in the duel arena. You can challenge anyone you like to a duel (see the Rules of the Duel below for reasons why it might not work).PvP Duelling Anywhere.You will not actually earn anything from duelling (no XP or equipment from defeated opponents will be given). However, you will also not die or lose anything if you are defeated. So why start a duel? Well, it’s really fun, it’s healthy competition and you can finally get people back for giggling at your character’s outfit! When starting a duel, both you and your opponents will be healed in full and any buffs/debuffs and adrenaline you have will be removed. You will see a countdown from 3 and then the word FIGHT! The attack option will then appear on your opponent. The duel will end when one of you reaches 0 life points. Both of you will have all your lifepoints restored to what they were at the start of the duel. Any buffs or debuffs from duelling will end. Woodcutting is a skill used to chop logs from trees. These logs can be used for Firemaking, Fletching, or possibly Construction. Simply click on a tree to chop it down. However, you will need to have the necessary hatchet in your inventory or toolbelt and a minimum Woodcutting level. You can add a hatchet to your toolbelt. If you do not meet the woodcutting requirement of the hatchet, it will act as the highest level hatchet you can use. If you are just starting out in Woodcutting you may want to pay a visit to Roddeck the Advisor in the building just east of the Lumbridge General Store to learn about the different kinds of trees and hatchets. You can get a free Bronze hatchet from Bob’s Brilliant Axes and a free Tinderbox from the Lumbridge General Store. If you are a member, you might also pay a visit to Larry the Lumberjack or Moe the Miner just south-west of Varrock to obtain a handy tool – the Dwarven army axe. This can be used as a Tinderbox and a Hatchet. You can also use a Bronze hatchet or Tinderbox from your Toolbelt. Hatchets are the primary tool for woodcutting. The better your hatchet, the higher your chance of getting logs from the tree. Machetes are members items and can only to be used on Karamja for cutting through jungle vegetation. They are mainly used for the Tai Bwo Wannai Clean-up minigame, but one is needed to get into the Kharazi Jungle on Karamja as well. You can also store one in your toolbelt. Higher tiered machetes may be purchased at Gabooty’s Tai Bwo Wannai Co-Op, or received from Safta Doc in exchange for gems (cut and uncut), trading sticks, and gout tuber. In this guide i will tell you the best and fastest way to get 99 hunter on the online game Runescape. Hunter is known to be as one of the easiest skillcapes to get on Runescape and it can also be quite profitable so if you are going for a quick 99 skillcape then this is the one for you. When hunting in Woodland and forest areas it is recommended that you wear full Larupia as this will camouflage your character and will increase your chances of catching whatever it is you are catching. You will also want to wear this when at the falconry as it will help here. To wear full Larupia you will need level 20 hunter. Full Larupia can be purchased from the grand exchange or from other players, it can also be crafted but its much easier if you were just to buy it. 60-80 = Red Salamanders: To catch Red Salamanders you will need to have 4 small nets and 4 ropes in your inventory. To catch Red Salamanders you will be using the same method used to catch Swamp Lizards. The Red Salamanders are located at the ZMI Alter which is north of Castle Wars. Other guides will recommend catching chinchompas at this level but this is not worth it until level 80. 80-99 = Red Chinchompas: To catch Red Chins you will need 5 box traps. The Red chins are located in the Feledip Hills by the lake that has the Hunter Paw marker next to it. The best method to catch the Red Chins is to set your box traps up in a X formation, what i mean by this is set the box traps up close together in the shape of an x with one box in the middle. You will also want to be in a populated world as this increases the spawn rate of the chins. If you reach 99 hunter you will gain 41k Red Chinchompas which can be sold at the g.e for a healthy profit of 35million gp depending on current grand exchange rates. Runescape God Wars Dungeon II will be updated on Tuesday, March 29th. As players of RS, are you ready to join in the mysterious journey? Do you have the desire to get boss drops thorough beating them down? Will you prepare powerful supplements for your character gained by buying runescape 3 gold for sale? And can bosses be done in teams or solo? Now, just come to rs3gold to read some latest news. There are 4 big bosses in this new update, and if you want to defeat them, you need to spend money and energy on them with the exception of your basic skill. The Bosses are considered team-bosses for Reaper Tasks, rewarding about 20 points. Boots and gloves aren’t been added and basic mode was tested in tier 80 gear, while Challenge Mode was tested in tier 90 gear. Mod Ramen can get 2 minute kills in Basic Mode, and 3.5 minutes in Challenge Mode with t90 gear. Fighting against Vindicta (Zaros General) needs 80 Attack，Twin Furies (Zamorak Generals) requires 80 Range, Helwyr (Seren Genera) needs 80 Magic, Gregorovic (Sliske General) requires 80 Prayer. Besides, the Reaper title, and songs will be the only requirements added for the regular Comp Cape. The environment is mysterious and based on deep blue color. It is an area of truce between the four factions. Each faction represents where you can turn in/spend reputation. You can only gain reputation, you can’t lose it. Feng is the Bounty Master. You can gain reputations with factions by completing a bounty from Feng. You can receive one a day stacking up to 5. Cosmetic Wings are rewards from the Zamorak Reputation system. Bear paws are rewards from the Seren Reptuation system. Luckily, you will get lots of good things from those bosses. As for God Armours, bosses will drop armour shards/crests similar to the blade shards/hilts in GWD1. Besids, you have the chance to get Magic, Melee, Range, and Hybrid Sets. As for weapons, you can get level 85 wear requirements with tier 80 damage and tier 90 accuracy. Weapons repair with coins. Weapons are whole drops from Bosses. As for armour: you can create Tier 80 Non-degradable set and then upgrade it into a Tier 85 set. The tier 85 will degrade into the tier 80. To repair it you use essence in the dungeon. Tier 80 is trade-able/augment-able. Tier 85 is untrade-able and unaugment-able. The 6 Boss Pets have threshold systems similar to that of Nex’s. The Bosses drop seals which can be turned to other factions for reputation. There will be no Lore book drops on release. In general, we hope that you can enjoy playing your game with those useful information, Besides, if you want to make progress fast and sacrifice less in game, you can try to buy cheap runescape 3 gold by applying the 10% off code “BESTDAY” to the order of runescape 3 gold ore. If you are looking forward to finding more cheap runescape 3 gold at lower prices and get them quickly. Please come to rs3gold where you can buy runescape 3 gold for sale at reasonable prices and receive your needs in a fast speed. If you log in rs3gold, you will find the prices of runescape 3 gold reasonable and acceptable. Carefully compared with others, you will be willing to choose our site to purchase what you needs. Good news is that great discount activity is going on. Now, we make a decision to provide Special Promos to all rs3gold customers. 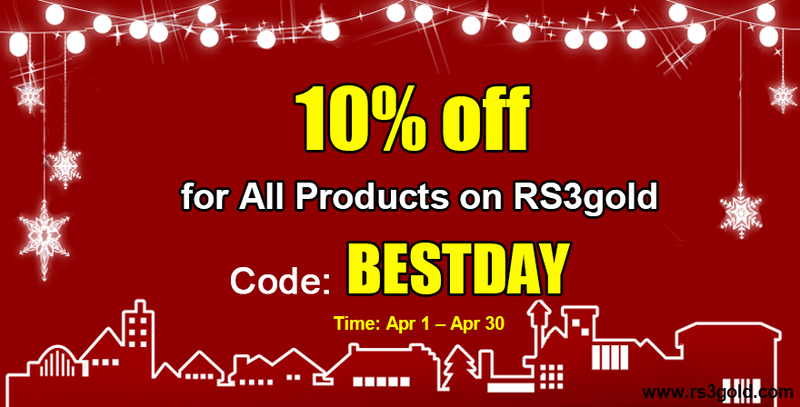 You can enjoy up to 10% discount for RS 3 gold, RS 07 gold and DS gold during special promos with the 10% off code “BESTDAY”. When you have paid your order successfully on our site, you may want to receive your needs as soos as possible, right? Well, If you have ever purchased rs gold at rs3gold, you must know that buy cheap rs gold here, you can reach your safe rs gold very fast around 10 minutes. That’s because a professional, responsible and anti-bot work team is offering you best services, and a common goal has been made – try hard to make every customer feel satisfied! Besides, face to face trade in the game will be adopted in no time. As for 24/7 Live Chat, once your order has been placed successfully on our site, your personal information will be verified and a meeting point will be arranged in advance. In that way, your order can be delivered on time. In general, as a prestigious runescape 3 gold seller, great efforts have been made to provide you cheap runescape 3 gold and other items in a wide range to satisfy your needs promptly. For a long term development, we will insist on providing the cheaper and safer rs gold for you and make sure that you can get what you want fast!